If you aren’t familiar with ALDI, the discount grocer carries a selection of Regular Buy food products that are always on the shelves, such as produce, milk, bread, eggs, baking supplies, canned goods, frozen produce and entrees, etc. In addition, each week the store sells a small selection of non-food Special Buy products — or what the grocer now likes to call ALDI Finds. These Finds usually revolve around a theme: kitchen gadgets, camping, or exercise, for example. Most ALDI products are of decent-to-very-good quality and are almost always less expensive than similar items at other retailers like traditional grocery stores, Walmart, Target, and even warehouse clubs like Costco or Sam’s Club. For that reason, I buy 90 to 95% of my family’s groceries from ALDI. It makes financial sense to buy as many of our household food and non-food needs from ALDI as possible. When the weekly ALDI ad comes out, it’s a little bit like looking at a Christmas catalog. My husband and I look forward to seeing what limited-time Special Buy or ALDI Find items will be on store shelves. With patience, we can get many of our household necessities from ALDI: bed sheets and blankets, bath towels, lawn furniture, gardening supplies, camping gear, cookware, lamps, shelves, home organizing supplies, and more. The only catch is that because ALDI is a low-inventory store, it doesn’t sell all of those products all the time. 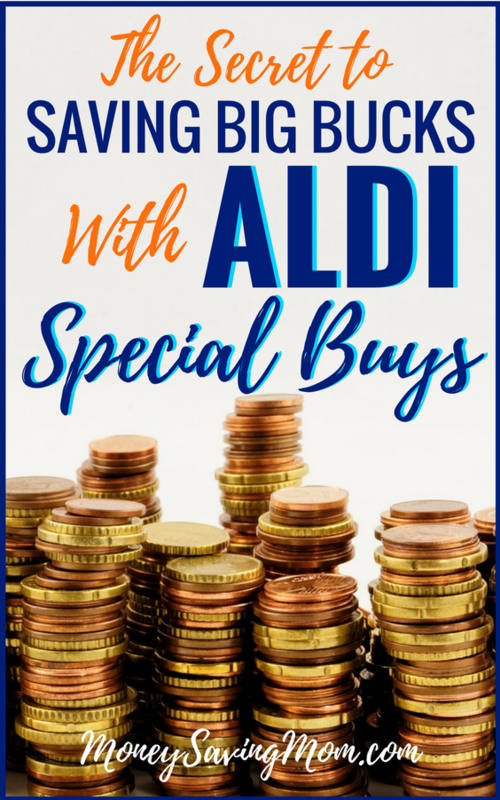 However, ALDI does tend to sell the same or similar Special Buy items on a yearly rotating schedule, so if you’ve seen it in the store before, chances are good that it will come back at some point. So patience is important. It’s also helpful to know that many themed Special Buy or ALDI Find products are sold at predictable times of the year. Exercise and fitness items hit the shelves around the New Year. Spring through summer is prime camping, gardening, barbecue, and lawn furniture season. Late summer is a good time to find twin bedding, bath towels, lamps, shelves, and other items that college students might use in their dorm rooms, or that you can use in your own home. Thanksgiving and Christmas are good times to find cookware, serving ware, and other kitchen items. Rather than feeling frustrated or shopping elsewhere because I can’t buy what I want when I want from ALDI, I’ve learned to view this as an advantage. I could simply go to Walmart or another retailer to immediately buy what I need, but often I don’t, especially if the need is not urgent. 1. Waiting helps cut impulse spending. Waiting allows me to think about whether I really need a product. Often after giving it some thought, I’ll realize I don’t need a new comforter because the old one still looks fine, or I don’t need a shiny new skillet because the old one is still serviceable. I might decide I don’t really want or have a need for the kitchen gadget I was thinking about a few months ago. Waiting also allows me to plan and budget for when I do eventually make a purchase. I feel more confident when it’s a purchase I’ve planned (and budgeted) for — perhaps months in advance, and I know it’s something I truly want or need. 2. Waiting may give me a lower price. ALDI’s non-food Special Buy items are not always cheaper, but they often are, even if it’s only by a small amount. This is sometimes true even of name brand items that you could find at other stores. Earlier this year, for example, ALDI sold an inflatable raft, the Intex Explorer 200, for $10.99 … significantly less than what Amazon, Walmart, or any other retailer was selling it for at that point! 3. Waiting allows me to support a business I like. Sure, ALDI is still a chain store, but ALDI compensates its workers better than most other retailers and grocers. Workers are paid well and receive excellent benefits. An ALDI employee told us last year that, while the work is hard, workers receive full-time benefits if they work 25 hours or more a week. That’s unusual in the modern working world. Sometimes waiting for ALDI to stock an item is not possible, like when my daughter’s bed sheet suddenly ripped and she needed new sheets right away. It happens. Or if a lawn chair broke and we needed a new one during the busy summer season. However, when I can wait, I do wait. It’s almost always worth the cost savings. Do you sometimes wait for items you need or want to come around as Special Buys at ALDI, or do you always buy them immediately from other stores? Rachael is senior editor of Aldi Reviewer, a website offering reviews of Aldi products, and she also writes for the parenting blog, Mumbling Mommy. In her spare time, she battles squirrels in her garden, reads Charlotte Bronte novels, and edits her husband’s science fiction novels. I found our metal window flower boxes at Aldi a few years ago for $5 each. Still my favorite Aldi find! A couple weeks ago we picked up trekker-type sandals as an Aldi Buy for the kids for next summer at an awesome price. Oh how I envy all of you who have Aldi. We take it a step further and watch for the special buys to get discounted! I have that attitude of waiting until I find it, but usually it’s with varagesale.com. Just found a perfectly sized painting for above our washroom toilet. Just $5. I would have paid $30 if I had picked something up at a store. I’ll have to think that way with Aldi too! LOVE Aldi special deals. Just bought my daughter a futon couch for her room for $80 and a 5×7 area rug for $20. The cheapest new futon we had found until we discovered the one at Aldi was $150 -and the one from Aldi is higher quality. The most unusual special deal item we ever bought was a bouncy house on clearance for less than renting one. We used it for years for our children’s birthday parties. At the end of last summer, our window AC for our living room broke. Instead of buying a new one, we just hunkered down on the other end of the apartment where that AC unit was running very nicely (one my parents had bought us from Aldi 4 years before). This year, we bought another at Aldi as soon as they came out. For $100, it was the same price as the cheapest at Walmart, etc but with a lot more BTUs which we need! I also bought a moving dolly there to use for craft shows. $30 and the quality is incredible. We do this all the time! We’ve gotten awesome camping gear, adorable black flats for my daughter (I even picked up two sizes, because– $5!) And found an awesome water table for my 3 year olds birthday present for a crazy low price. My husband knows now to just wait and Aldi will have it 🙂 He frequently wants to come along and check out the deals! I bought a cheap lightweight vacuum from Aldi years ago, we only had a few 8×10 rugs to clean, so quality wasn’t of high importance at the time. I loved that vac so much-it was a workhorse! It was so much better than I would have imagined. Unfortunately, the cord got damaged, but I had it repaired at the local vac shop for $30, which was what I had paid for the vac. It ran for another 10 years! I am sold on the Special Purchase deals for most things, especially the anti fatigue kitchen mats! Awesome cheat sheet for when to get non food items at Aldi. It’s true, in January when I get my Aldi flyer I am always drooling over the cool fitness gear, but never get any of it because I wasnt expecting it and didn’t budget it in. Now I can be prepared! My husband is a woodworker/carpenter and I’ve bought him an ax, rasps, chisel, work bins, ready lift gear, head lamps and many more things I’ve usually said, “We could really use _________ for work” and there it is on Aldi Finds! I got a great cast iron pot from Aldi years ago – and it is still going strong! I also just bought some great pillows from there 2 for 6.99!!! My favorite non food buys were the sand and water table for $20 and my camping cots for $15 each. Stocked up on sheets and towels this past week for college bound son. We have a number of 6′ folding tables and over the summer, Aldi had benches to match for $25 each. They are awesome and we have instant seating for gatherings without taking up tons of space.